I can directly point to the presence of strong women role models during my formative years as contributing factors to my current feminist identity. If you’re like me, the presence of elder women—be they our mothers, grandmothers, aunts, or godmothers—had a direct impact in shaping who we are to become. While the younger generations watch, they deal with loss, transition, triumph, and sadness. We observe and we learn… and maybe we become a little bit like them in the process. 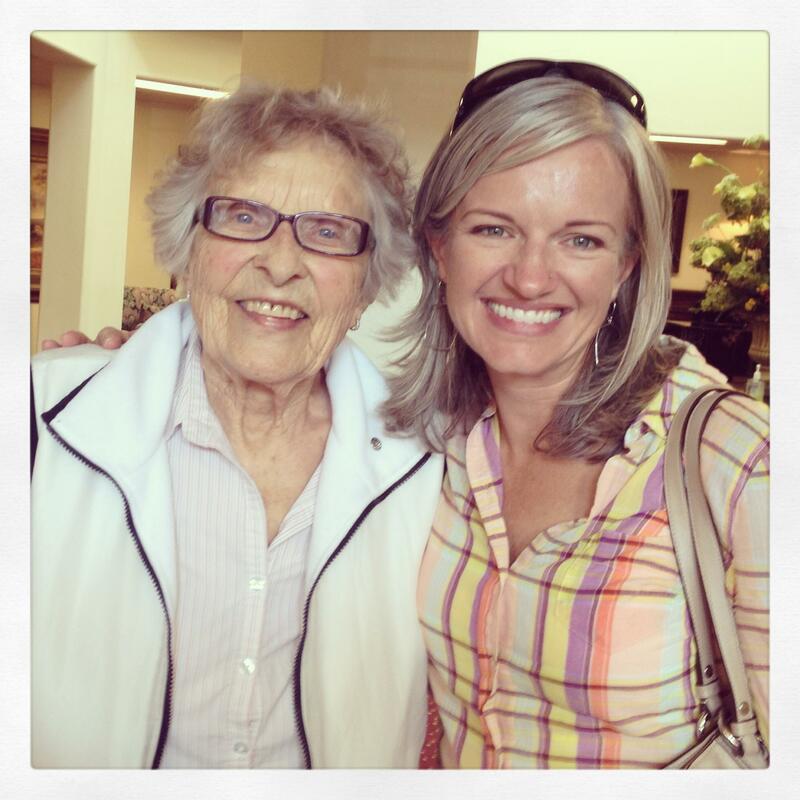 I’m reflecting on the presence of strong women because my 94-year old grandmother recently passed away. Born just months before women got the right to vote in 1920, she was one of eight children (two girls, six boys) who grew up in southern Colorado near Lamar. My grandmother had two children, my Father and nine years later, my Aunt Timi. She had four grandchildren, of which I am the oldest and the only girl. My grandmother taught me independence of mind, spirit, and body. After my grandfather passed away in the mid-1970s, when I was only 2, she became an even stronger independent spirit, figuring out life on her own terms. All who knew her would agree, she was direct and had many opinions! She was fiercely tenacious and persistent with a quick wit and a loud laugh. She was socially engaging and constantly in conversation with people around her. She had a wide circle of friends and family who moved with her direction. She was in charge and everyone knew it and respected it. She was an incredibly hard worker and ran circles around all of us when it was time to pack for a move, paint a room, wash windows, or butcher the chickens. From her I learned the fine craft of crochet and basics of plant care (she was a master gardener and had a true green thumb with dozens of houseplants). My artistic eye and skills are directly inherited traits from my Grandma Mabel, she was a fine oil painter and a creative genius with yarn and plastic webbing. I also learned creativity in cooking (not sure what was actually measured?) and basic driving skills. She was the first to take me out driving on the back roads outside Limon, Colorado when I was only 12. We giggled the whole way home. She was an avid bowler (sadly, I never picked up these skills) and a die-hard Denver Broncos fan who never missed a game. From her I also learned to love exercise and value my health and wellbeing. She walked at least a mile religiously every day and seemed to have energy to spare – which is probably a primary contributing factor to her longevity. 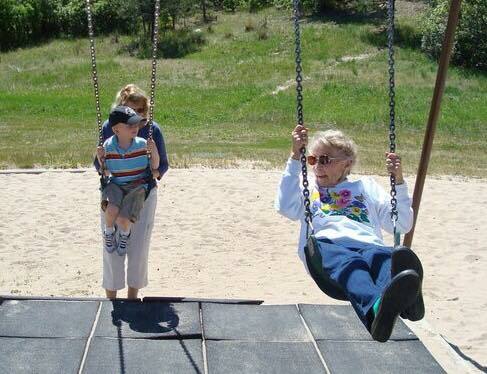 One of my favorite pictures is this one of her at 89, laughing while swinging at a playground with my oldest son. Probably most of all, I witnessed her youthfulness and playfulness. She was truly “young at heart.” To my children, she was “Gigi” (short for Great-Grandmother) and they adored her. A fiercely devout Catholic, Grandma ended every hand written card (in her nearly illegible scrawl) and phone call with the words “God Love You”. There’s no denying the influential presence of strong feminist women in our lives. My grandmother was among the strongest and “feminist” is the perfect description of the life she led. Join me. Honor the strong women role models in your life. We have them to thank for who we are and what we have. We observe their paths and we learn from them… And maybe we become a little bit like them in the process. I hope I’ll be half woman she was. For now, I’m simply grateful I was her granddaughter. God Love You, Grandma. Peace be with you. Heather, What a fitting tribute to an inspiring woman. I love how you weave our talents and tendencies into a web of interconnectedness to our foremothers. We all carry the DNA of these women, and they deserve our respect and honor through emulation. I know how true your opening line is — my great-grandmother, Virginia, saved my spirit and molded my life in so many ways. Here’s to the women who came before us. May we live up to their legacy. There’s a Catholic Hymnal that we used to sing all the time in grade school during mass, and the refrain was this, “They’ll know we’re Christians by our love.” I like to think of feminism and (really role modeling) in this way. We know people to espouse beliefs by their actions and their presence. Sounds like you know Mabel to be a feminist by not only her love but the way she interacted with everyone around her. 🙂 Cheers to Mabel and the other strong women who lit paths for others and inspired. Thanks for sharing, HSG! Heather, condolences and thank you for this. You reflect some of what I have been hearing from the female students in my dissertation study about the powerful female influences in their lives. We do need to recognize, appreciate and honor those women who helped shaped us – and the continuing ripple effects of their influence. How lucky you are to have had such a meaningful relationship with her! What beautiful words!